Spring is a perfect time for freshness but also for a bit of heat. 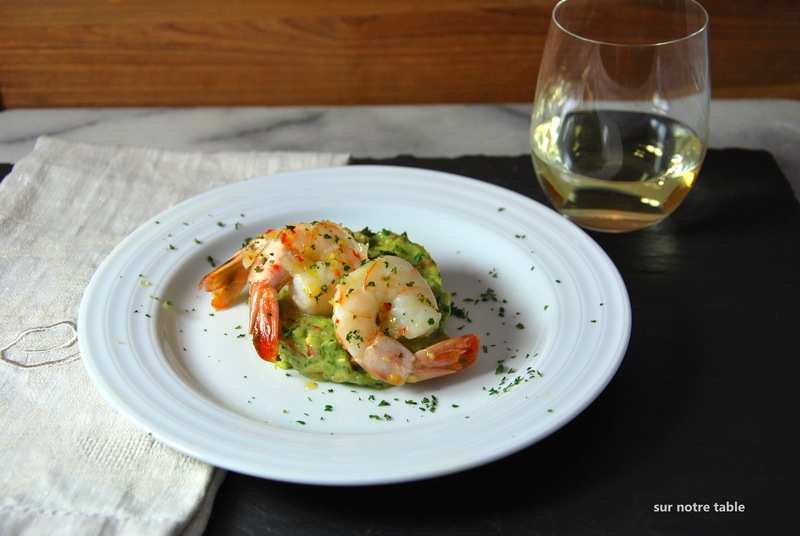 Here’s a great shrimp appetizer to serve to your guests that has a little bit of kick but is gently tempered by some refreshing guacamole. The secret to cooking this shrimp is the addition of a homemade sweet and spicy chill sauce. 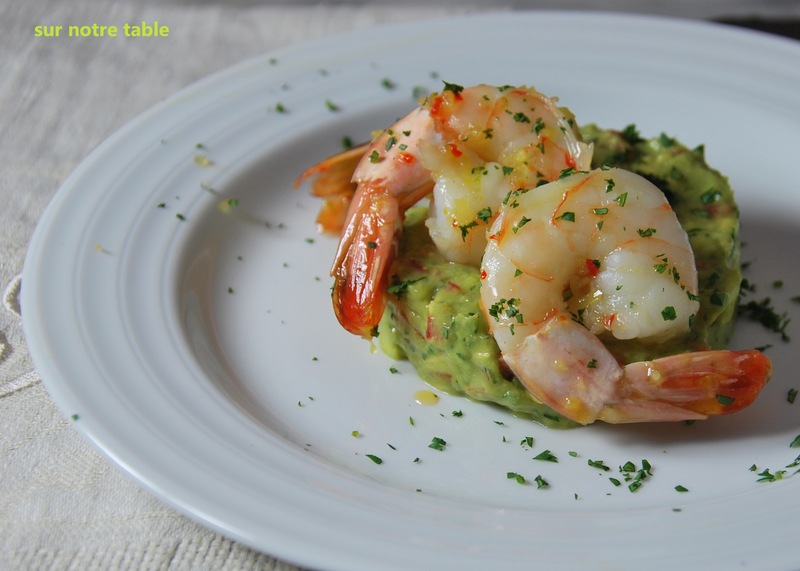 There are three parts to preparing this appetizer, in addition to cooking the shrimp, you will have to make guacamole and prepare the sweet and spicy chili sauce. It does take a little work, but thankfully the sweet and spicy chili sauce and the guacamole can both be prepared in advance. You then just need to cook the shrimp before you’re ready to serve your guests. This is not a complicated recipe, it just involves a lot of chopping and mincing. However I guarantee that the efforts you put behind this will be worth it! Add sesame oil to a pan over medium heat. Add ginger, garlic, shallots and hot red peppers and sauté until softened for about 2 minutes. Add sugar and water to the pan and stir gently until sugar has dissolved. Let sauce simmer gently for about 10 minutes, until sauce has slightly thickened and has slightly darkened in colour. No need to stir as the sugar could crystallize. Transfer sauce to a bowl, and add lemon and lime rind. Let it cool and season with salt to taste. You will have enough of the sauce for another meal, as this makes about 3/4 cup, and you can keep this sauce in the refrigerator for about 5 days. Combine all ingredients together in a medium bowl and roughly mash together. Season with salt and refrigerate until needed. To keep in refrigerator cover the surface of guacamole very tightly with plastic wrap to ensure there is no air. This will allow you to keep the guacamole for up to a day in the refrigerator. Heat a medium frying pan over high heat and add sesame oil to pan. Then add shrimp and sauté with a little kosher salt. When shrimp is halfway cooked, after 1-2 minutes or so, add the 2 tablespoons of the sweet and spicy chili sauce and caramelize for about another minute. Remove from heat. To serve place 2 tablespoons of guacamole on a small plate and top with two or three shrimps depending on the quantity of shrimp you have cooked. Garnish with cilantro and serve. It’s quite pleasant with a glass of chilled white wine, my preference being a sancerre blanc! Game time means Chili time! Yes, the Super bowl gives you the best excuse to have chili, but why limit yourself to Super Bowl to indulge on chili? 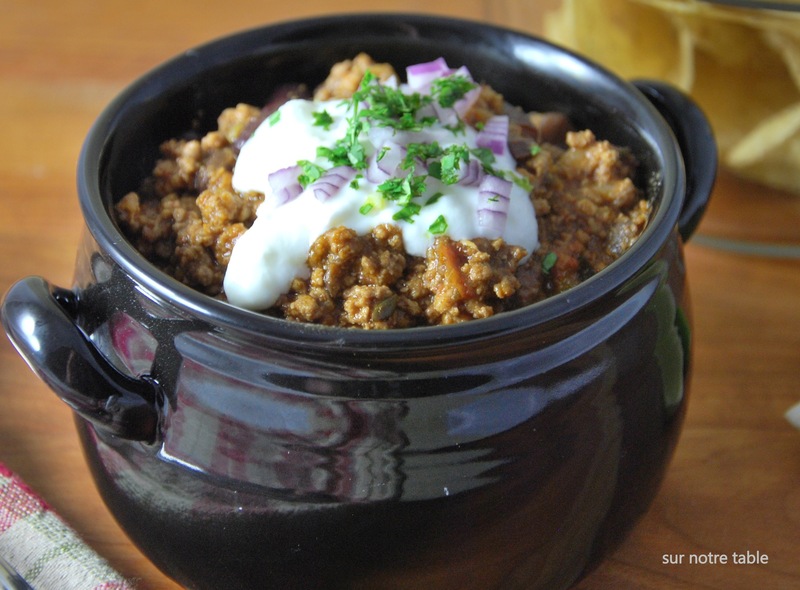 Chili is not only nutritious (lean meats and fibre from the beans) but it’s easy to make, can be prepared in advance and even frozen for a quick weeknight meal. The chili can be kept in the freezer for about a month. 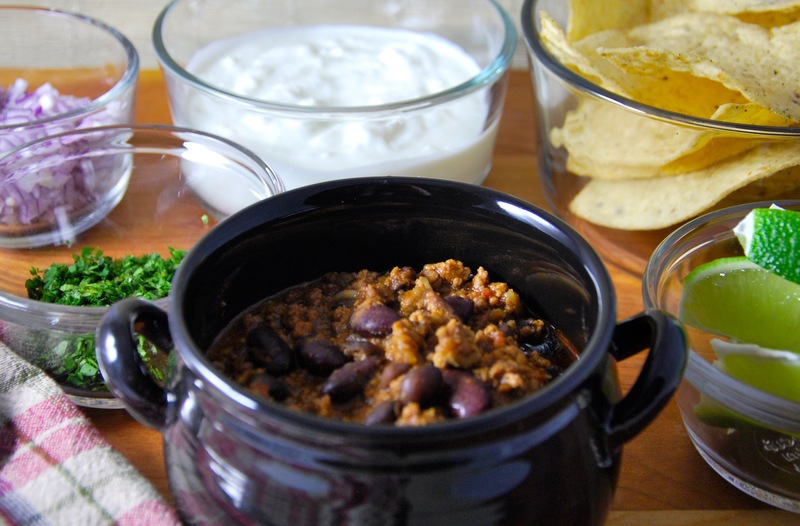 If you don’t already have a favourite family chili recipe, here’s one which has a little bit of heat but not too much, so everyone in the family can enjoy it. Unlike the Texan chili, this one does include tomatoes and beans. There’s even beer in it too! You can make it exclusively with ground beef, but I prefer to mix up and add ground veal to the ground beef. Another variance is to substitute the ground veal for ground lamb. The best part about this chili is what I call the “accoutrements”, or the toppings, if you prefer. The toppings bring it to another level and allow those eating the chili to tailor it to their own taste with more or less sour cream, cilantro, onions and/or lime. This recipe slowly simmers for about an hour and half and will serve 8 to 10. Heat oil in the Dutch oven or large 4 to 5 quart pot over medium-high heat. Add onions and sauté onions until soft and translucent, about 8 minutes. Add garlic and heat for 2 minutes until fragrant. Add ground beef and veal and sauté until meat is no longer pink, about 5 minutes. Add chili powder, cumin, cayenne pepper, oregano and thyme and stir in. Mix in diced tomatoes, beef broth, beer, tomato paste and beans. Simmer in Dutch oven on the stove top for about 1 ½ hours. Make sure to simmer over low heat or else you will loose too much of the liquid and dry it out. Season to taste with salt and pepper. If you don’t find it spicy enough for your taste, you can simply just add a little more cayenne pepper. Serve chili into warmed bowls and let guests garnish their portions of chili with sour cream, onions, cilantro and/or lime. You can also serve tortilla chips and do as my parents do, use the tortilla chips to scoop up every bite of chili! Serve with beer and enjoy the game! Super easy finger-lickin’ good tender baby back ribs! BBQ “finger lickin’ good” spicy sweet sticky wings!